‘Electronic Literature’ could refer to quite different things: a novel written in the form of emails, a poem in Cordite (poetry is code! ), a piece of musique concrète, an interactive installation in a gallery, a thread of You Tube comments, the Wikileaks cables . . . Understood broadly it could include any piece of literature making use of an electronic technology – e.g. Microsoft Word – somewhere along the line. What literature today isn’t electronic? might be the more productive question to start with. 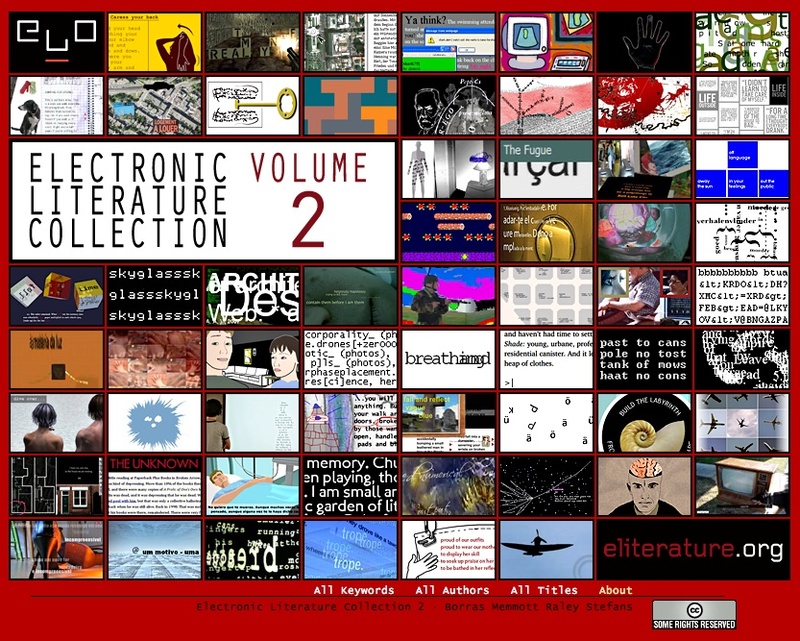 The Electronic Literature Organisation (ELO) – the editors of this collection – include in the category of E-literature, ‘works with important literary aspects that take advantage of the capabilities and contexts provided by the stand-alone or networked computer.’ Literature, then, which consciously, rather than complacently, makes use of electronic technologies and computer software as a means of its composition. Employed in this context the term ‘literature’, with such a long memory of print, begins to sound slightly ananchronistic. A pervasively digital, screen-based and networked environment does augur new reading experiences; accordingly, new terminology and concepts (such as Gregory Ulmer’s ‘electracy’) are required. That said, for the time being we’re reading, looking at and listening to ‘electronic literature’, a genre which might be understood as a hybrid one, marking a point between a literacy – and a literary criticism – specific to print, and one native to the newer media forms. This collection, which was published in February 2011, uses a similar design and structure to the first volume, which came out late in 2006. As with that earlier volume, a large amount of material has been gathered here, 62 separate works, mostly from the latter years of the last decade, and a couple from last century. The earliest is the visual poet Geoff Huth’s Endemic Battle Collage from 1986, and the majority of the work comes from European and North American authors, where most of the centres with a research interest in E-literature are located. Each piece is accessible from the opening page, and represented by a single tile. The mosaic that these tiles create illustrates the attempt to bring together under one name works with often very different aesthetics and provenances. Each tile links to a page which contains a short blurb, an author description, and operating instructions for that work. These are often interesting pieces of writing in themselves, but the necessity to pass through the critical gloss on a work on the way to the work itself does get wearying sometimes. I’ll mention a few of the pieces I liked in brief before before going on to talk in more detail about three. Christine Wilks’ two Flash-based works, are Tailspin and Fitting the Pattern; the former is a work which makes careful use of sound, exploring thresholds of hearing in the context of a family relationship; the latter work lures the reader easily through different sections of a text by requiring him or her to carry out virtual versions of actions used in tailoring (cutting, pinning and so on), as a way of revealing sections of text: a series of memories about the author’s dressmaker mother. Public Secrets, made by Sharon Daniel and Erik Loyer, takes as its subject the legislated silence around prisons in California since their government introduced a ban on journalists reporting from inside them in the 1990s. Specifically the work relates to women’s prisons, using the voices of inmates recorded over a three-year period in which the authors worked as legal advocates (a role which excluded them from that media ban). The choice to base the work around the recorded voices of the women evokes their world in a way that a piece more dependent on visual imagery would not have been able to. The elements of the piece act in combination to put into context, theoretically and politically, the silence around the question of prisons generally, without losing the very practical aim of granting a voice to the women represented. Australian Mez Breeze’s _cross.ova.ing ][4rm.blog.2.log][_, written in her invented digital creole ‘mezangelle’, is a relief because of its stillness among more hectic works. The ‘electronic-ness’ of the work is incorporated into the language itself and resembles a page of print, static black text on a white background. Similar in its print-like appearance, Bjørn Magnhildøen’s Plaintextperformance is appealing for its slowness. Presented here is a recorded version of a live performance of various types of ‘writing’ unfolding, human and algorithm determined, which scrolls slowly down the page, encouraging the feeling that one can leave it and come back to it after browsing some of the other works, then return and note the changes. Caitlin Fisher’s Andromeda is, in the real world, a kind of children’s pop-up book, constructed partly with computer-readable cards. The book can be held up to and then ‘read’ by a computer through a webcam; the computer software then translates this information into text which is displayed on its monitor. The operator of the work is thus both reading to the computer (as a parent to a child) and being read to by it. While I only understand in a basic way how this piece actually operates, the video documentation of the process (as a unique object, probably the only way it could have been included in the collection) is intriguing. I could go on like this for a while, giving short appreciative glosses for many of the works. Andreas Jacobs’ Semantic Disturbances is a suite of four pieces originally published online individually as fluidal, radiator, destruction and architexture, each of which use the same format to different effects. 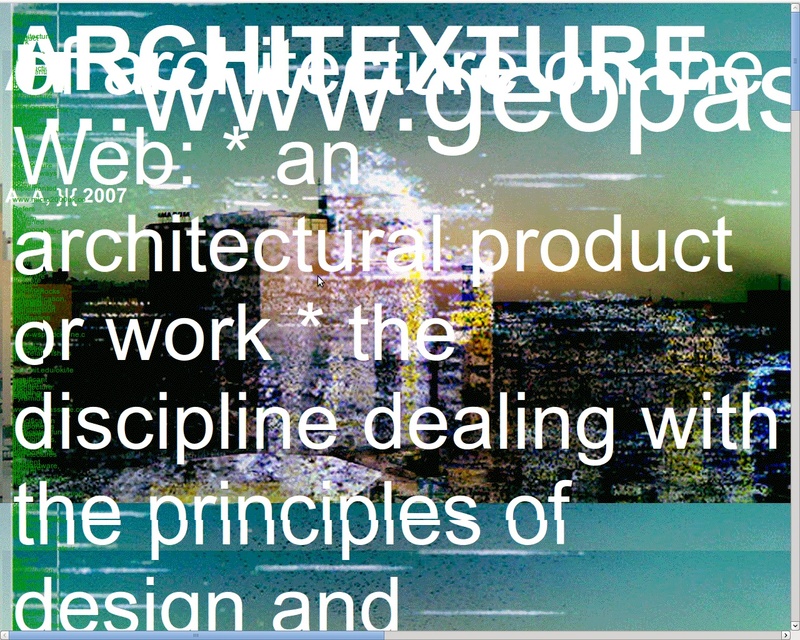 The critical precis describes the work, slightly fancifully, as ‘like photographs of the very self-generation of the internet, exploding the image with algorithmically determined deformations that quickly overwhelm the space of the monitor.’ The pieces invite contemplation more than active interaction. Rolling the mouse over search terms stacked along the left side of the screen illuminates them as if they were links and sometimes ‘announces’ them in larger type in the centre of the screen, yet clicking on them doesn’t seem to trigger other events on the screen. It is an obdurate piece that sits somewhere between high-modernism and the screensaver. Jacobs here successfully explores the nature of the media he is working in, and the work is illustrative of a ‘slow’, perhaps minimalist, strain of net.art and digital writing, one native to the web. One of the difficulties in generalising about the collection is that, while the categories are clearly delimited and navigable by tags, there is not (as far as I can tell) an aesthetic criteria holding the collection together. This diversity is also, of course, the point. A glance at the list of 49 keyword tags gives a sense of the breadth of the collection and of the editors’ interest in providing a watertight taxonomy. Held together by medium alone – the ‘electronic-ness’ of the pieces – it is unlikely that all or even most will appeal to a single reader. This is probably the case with any large anthology; the idea perhaps being that a reader interested in the form may find a few pieces they like, or a style they can glom onto, and from there begin to explore and read beyond it. Working my way through the collection I find I lean towards the more ambient works, those which can drift into the background for periods, and which, as the description for the ‘ambient’ category states, are ‘meant to evoke or engage intermittent attention’ – a state often associated with the rise of networked electronic media. There are of course many exceptions to this preference – the highly syncopated text-jazz combinations of Young Hae Chang Heavy Industries (oddly, not represented here) are the most obvious of those which elicit a high degree of visual and aural attention from the reader for a limited amount of time. 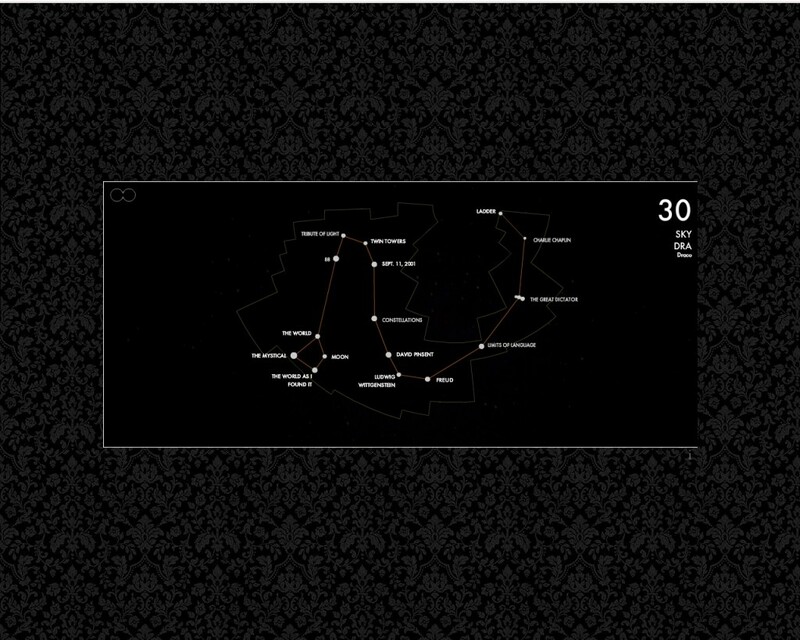 88 Constellations for Wittgenstein by David Clark is a kind of Wunderkammer, a Flash based, documentary-like work made up of short movie assemblages which take the life and philosophy of Wittgenstein as a heuristic device through which to explore interrelated 20th century cultural and historical phenomena (starting from Wittgenstein’s birth in 1889, to 2001). The number of the title, 88, often returns as a generator of links – sometimes via slightly paranoiac association – between historically and geographically diverse events. There is a large cast of characters – Wittgenstein’s coevals Adolf Hitler and Charlie Chaplin; and Carmen Miranda, John Cage, Alan Turing are a few. The reader chooses a constellation from a schematic map of the entire night sky, then once ‘inside’, moves along by interest, proceeding by clicking on the associated points in each constellation designated by titles such as ‘Fly Bottle’, ‘Pointing’. ‘Prater’, ‘Otto Weininger’, ‘Aphasia’. The experience of reading and operating the work is less to do with where one is going, or where one is, than with getting a sense of how the different ideas in the constellation are associated. The work integrates the kinds of still and video imagery made available by the proliferation of the scanner and the resulting digitization of archives, and puts them to work in a hypertext environment. The juxtaposition of materials from different periods is one of the things that energizes the work and lends it surprise. It is an example of the ways that lateral connections can be made in critical works that are native to an electronic environment. David Jhave Johnston (another contributor to the collection) writes of the work on his Digital Poetry Overview blog, in hybrid terms, calling it, ‘a consummate example of hybrid interactivity, future cinema, net-art and scholarship’. It’s a highly polished work, and one which, unlike ‘Semantic Disturbances’, seems to sit happily within the frame or proscenium of the browser. 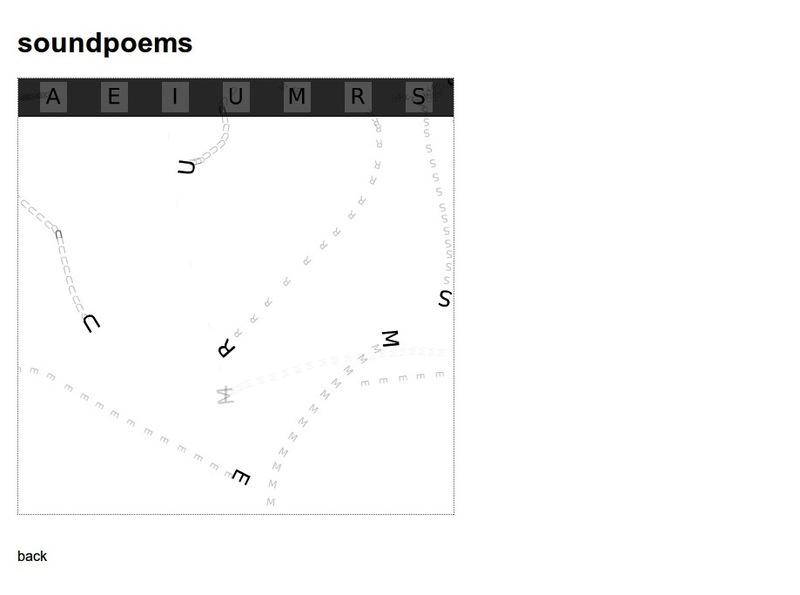 Screenshot from Jörg Piringer’s soundpoems. Jörg Piringer’s trio of soundpoems are fairly simple in appearance. The three pieces all use the same format: a rectangle in which the letters are motivated in different ways to trigger a range of phonemes to sound. In one of these (food chain), mouse clicks set down vowels (ä, ë, ö, ü) to be crashed through by roving consonants (P, T, X, Z, K), producing robotic utterances (Tö, Zö , Kë, Xä, etc.) for each collision. In another (predator vs prey), a set of letters and vowels at the top of the rectangle (A, E, I, O, U, M, R, S) produce when clicked on letters which then drop down into the rectangle and perform relaxed twirls while buzzing their own sound for a minute or so, until they collide with another letter and fade to white. As more are clicked on a personal sound mix is created. In this structural way (though not in others) there is a similarity to Jason Nelson’s wonderful early Conversation works, another trio in which the user is able to create her or his own ‘verbal compositions’ from different tracks. Jason Nelson is represented in this collection by two more recent works (though not his most recent), This is how you will die, and game, game, game and again game, which explore and reinvent the interfaces of the slot machine and the platform video game respectively. 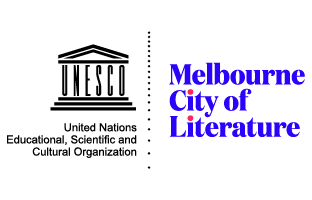 The ‘freeing up’ of text so that it can be recombined in surprising ways seems to be a recurring theme of E-literature, an echo of the spirit of Marinetti’s parole in libertà (along with other early 20th century Modernist explorations of the formal properties of language) plugged in and put online. It’s seen, in very different ways, in works from the first volume like Kenneth Goldsmith’s Soliloquy, Patrick-Henri Burgaud’s Jean-Pierre Balpe ou les Lettres Dérangées and Jim Andrews et al’s Stir Fry Texts; and in works such as Magnhildøen’s Plaintextperformance, Bruno Nadeau and Jason Lewis’ Still Standing, Oni Buchanan’s The Mandrake Vehicles, and K Michel and Dirk Vis’ Ah in this volume. In works such as these the soldierly stillness of letters on a page of a printed text is evoked, often mimicked in some way, before the letters ‘detach’ and move around the screen, parading their newly found weightlessness. (This ‘freeing up’ of language is evident in other ways too: by breaking his own language down to its phonemic parts, Piringer’s piece illuminates the overlapping spaces between languages.) These works explore the latent potential of alphabet letters as they inhabit a screen environment, while thinking back to their origins in print; they remain in a close dialogue with the technology of the book. As new media theorist N. Katherine Hayles stated in her 2004 essay ‘Print is Flat, Code is Deep’, electronic literature allows us, ‘the chance to see print with new eyes.’ After spending time with works which employ mutable and shifting text, printed text in a book begins to look different: its stillness comes to be interesting in a way it wasn’t before. Screenshot from Andreas Jacobs’ Semantic Disturbances. One question to ask of the individual works represented here is: How do they imagine the computer that they inhabit? To different degrees, as a box containing a bundle of software packages, attached to a screen, speakers, a keyboard and a mouse, to be activated by the work itself and the user operating it. At other times, the work places itself as a point on a larger network, an example would be Ton Ferret’s The Fugue Book, which requires the reader to connect to it through their Facebook account. Not being a subscriber to that particular network, I did not actually experience ‘Fugue Book’ in action, however in concept it points to questions about how E-lit and net.art might make incursions into the more platform-dominated ‘web 2.0’, and explore the social relations around them: an electronic ‘relational aesthetics’, if such a thing is possible. There are also those works – like ‘Semantic Disturbances’, again – which see the browser or the screen, as calcified technologies, to be broken out of or somehow worked against, in a similar way to Pound, a century ago, wanting to bust up the pentameter. (The name of Google’s browser, “ Chrome”, is suggestive of this fixity in the way we’ve come to experience and interact with the internet.) The impatience with the idea of a screen as a passive surface, and an apparent desire to want to move beyond it is perhaps best represented by the title Up Against the Screen Motherfuckers by Justin Katko. Other works aim to draw attention to that greater ‘link’ back to the body operating the computer. Some of the works seem to understand the computer (a laptop or a desktop) as a kind of furniture, one we may have become too comfortable with. After clicking impatiently several times to get the next word of a poem revealed in this way, Annie Abraham’s English/French work separation/séparation informs, alternatively, ‘Vous n’avez pas le bonne attitude devant l’ordinateur’ / ‘You do not have the right attitude in front of your computer.’ I am instructed to do an exercise demonstrated on the screen, ‘Open your eyes as wide as possible and lift your eyebrows for five seconds’; a bar appears on the screen indicating the elapsed and remaining time. A bit later, another punishment/exercise requires standing up, and as I am doing so I notice a large orange painting on the wall of the room I am in. I had registered it before, but realise then that I had never looked at it for any length of time. The composer Edgar Varèse once said that the greatest pleasure the radio gave was turning it off. The same could be said of electronic literature and clicking Shut Down. Though the editors have clearly worked hard to make the collection widely accessible – indeed that appears to be one of their main aims: to create a portable anthology of recent E-literature – about a quarter of the works require software packages (such as Shockwave and Quicktime) to be installed on the computer, and this will immediately send some readers onto the next piece. This reader, sometimes, included. Once, when trying to load up one interactive fiction, I was informed by the program, ‘Sorry, your computer is too slow.’ These obstacles should be weighed against the collection itself being free, not just over the internet but, as with the first collection, as a DVD-ROM, free (according to the details on the site) to any one who writes to the mail address and asks for one. When I reviewed the first Electronic Literature Collection five years ago I began by quoting from the category description for ‘poetry’, on that site and on this one, which states that electronic writing is ‘under continual construction (poeisis)’. The clean design and structure of the site, particularly the opening mosaic – more reminiscent of a checkerboard than a construction site – can sometimes suggest otherwise. The process of gathering, archiving and tagging the works to make them more easily available to a wider audience, also freezes (necessarily) what may have been otherwise ephemeral or in situ. The keyword system remains a valuable framework for exploring the site and for gaining a critical understanding of the works. However implicit within it, for the experimental practitioner, is the challenge to make works that call for new categories. 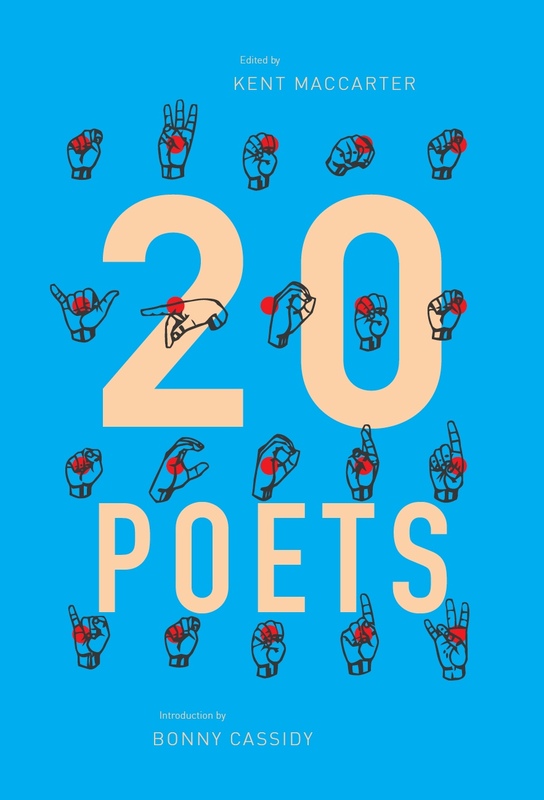 This entry was posted in ESSAYS and tagged anthologies, Brian Stefans, e-lit, electronica, ELO, Laura Borràs, Rita Raley, Talan Memmott, Tim Wright. Bookmark the permalink.